Raymond Harrison of Clearwater, BC, passed away suddenly on June 26, 2017 in Clearwater at 56 years of age. 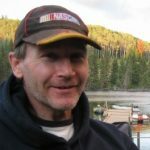 Born in Kamloops BC on April 21, 1961, Raymond is survived by his wife Jerrie; sons Raymond (Heather), Keith (Natalia); children Grant (Janel), Randy (Tiffany); grandchildren Jessica, Rebecca, Jase, Hadley, Bryce, Moria and Kennedy; his father Raymond G. Harrison (Joan); siblings Gary Harrison, Carol Hull, Earl Harrison (Pati), Todd Harrison, Marie Wides (David); step-siblings Deanna, Lani and Greg; as well as numerous nieces and nephews. Raymond was predeceased by his mother, Fanny Harrison Sutherland. Raymond spent much of his life working in the forest industry. He owned a logging truck and was a log truck union rep. at Weyerhaeuser. He also operated a fork lift and he was a tire specialist. Raymond was a grade 12 graduate from high school. Raymond was active in sports, the outdoors and in his community. He loved water skiing, camping, fishing, hiking, snowmobiling, boating, rodeos, and baseball. He was involved in Clearwater Minor Ball and Minor Hockey and took delight that his boys participated. Raymond loved to invent things and to fix things – he was able to fix anything! He was everyone’s friend and he would help anyone anytime, in any situation. If Raymond could pass anything on to the rest of us, it would be: to be kind to one another, don’t judge, and help whenever possible. Dear Jerri and family. I am so very sorry to hear of your husband and father’s passing. Hugs to you Jerri and know I am thinking of you ♥. Ray was a sweet,kind and loving human. We could all learn much from this wonderfully strong Man. He never gave up. I I’ll miss him greatly but know he is in a way better place. Sorry to hear about Raymond’s passing,Jerri & all the family may you find comfort knowing that he is at rest.Thinking of you at this difficult time! We are so sorry over your loss extending our thoughts and prayers on your behalf at this difficult time. Raymond will be missed in our neighbourhood. So sorry for your loss. Raymond was a great guy. Thanks Luc. It was great to see you at the funeral! I am thankful you had the priviledge of working with my Dad and getting to know him! Jerrie and family, My sympathies for the loss of Raymond.His thoughtful friendly,inspirational demeanor will be remembered. Raymond always had time and great to talk with. He was a positive terrific individual! Thanks alot for your words Jim!